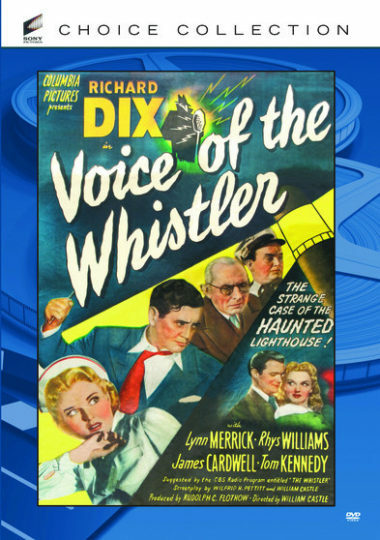 Voice of The Whistler – Wealthy industrialist John Sinclair (Richard Dix, Cimarron) seems to have it all, but he has no friends or loved ones. When he falls ill, he is sent away to the Great Lakes for vacation, but he has another episode and ends up at a clinic. There, he meets Joan (Lynn Merrick, The Blonde from Brooklyn), a nurse engaged to internist Fred Graham (James Cardwell, He Walked by Night). John is told he only has months to live and asks Joan to go away with him to Maine telling Joan hed give her his entire fortune when he passes. Joan grudgingly agrees, telling her fiance it will help their future. But when John regains his health and falls for Joan, their agreement changes, and Fred appears in Maine, wanting her back. Both men seem willing to do anything to keep Joan, including murder. The 4th film of the Columbia series based on the CBS radio program, “The Whistler.” Starring: Richard Dix, Lynn Merrick, Rhys Williams. 1945 – BW – 60 Minutes.